The Highlanders are generally quite proud of their heritage, their traditions, and their uniqueness. I know, because I’m engaged to one. From their faithfulness to Scottish football, to their pride in adorning the kilt and embracing Céilidh dances and the traditional events of the Highland games, one could say that a typical Highlander is in no doubt about his/her identity, and keen to show that to the world. So you can imagine my surprise when I met not just one but five Highlanders who all expressed annoyance at talks about saving Gaelic by encouraging children to study it at school and the introduction of Gaelic into bilingual road signs (see above picture). They unanimously argued that Gaelic is a dying language and that it is useless and impractical for their children to spend their time on – time which was presumably better spent on learning languages like Spanish or Mandarin. 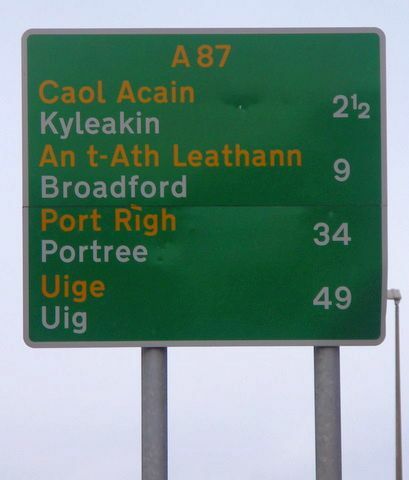 The bilingual road signs, they insisted, were the product of a profit-making scheme by the government to attract tourists to Scotland – tourists who might find Gaelic exotic and exciting. While more than 6000 languages exist today, Swerdlow (1999) predicted that by the year 2100, the number of languages on our planet could fall to 3000. Schaefer and Ebokhare (1999) who investigated the loss of African languages in southern Nigeria concluded that English is giving rise to the abandonment of indigenous, minority languages. But this phenomenon of the global spread of English giving rise to the extinction of indigenous languages is not a new one. We in the UK need to look no further than Scotland and Ireland to see how English has not only taken over the local languages, but perhaps also their culture. If one believes in the Sapir-Whorf hypothesis that we see the world through the tinted lenses of the language we speak, then despite attempts to keep out the English, whether it be by historical wars waged by William Wallace or wearing ABE (Anyone but England) T-shirts at the World Cup, the Highlanders are already allowing the imperialism of their culture and their view of the world by taking on the English language. In response to my passionate plea, these North-Eastern Highlanders claimed that Gaelic was not only unrepresentative of their identity, but that it was spoken mainly by people from the Western Isles such as those in the Inner and Outer Hebrides, and that those in the East originally spoke Norwegian dialects. They then jokingly stated that if the government had wanted to preserve their historical roots, the road signs should have been in Norwegian. I found all this quite interesting, but a little hard to believe, so I decided to go ahead and do my own research on the origins of Gaelic. While my friends are right about the fact that Gaelic is now seen as a regional language spoken largely on islands like Skye, Harris and Lewis, historically, it was actually the language spoken by the majority of Scotland. It is not clear how old Gaelic is but there is written evidence of the language dating back to as far as the 5th Century. Gaelic flourished for many centuries and even replaced Pictish as the main language of Scotland north of the River Forth in Edinburgh. It only began to suffer a decline in status as a national language in parts of mainland Scotland in the 13th Century, gradually being displaced by English. Ngugi (1986) describes how colonial powers devalue the culture of the local people and try to replace their language with that of the colonizer, and, in this way, control the way the people perceive themselves and the world, thus dominating and colonizing their minds. Yet, the Highlanders stubbornly resisted and the language survived. The highland-lowland line emerged and Highland Gaelic, or what we know as Scottish Gaelic today, eventually became one that distinguished the Highlanders from the Lowlanders, who had their own brand of Lowland Gaelic, a dialect that is now completely defunct. Having been the language of the bardic culture of the Highland clans for many years, Scottish Gaelic preserves knowledge of pre-feudal ‘tribal’ laws and customs and was representative of the Highlanders and their traditions. These traditions, alongside the language, were unfortunately persecuted during the Battle of Culloden in 1746 where the Jacobites, made up of an army of mostly Highlanders, failed at their attempts to overthrow the reigning House of Hanover. The Highlanders and their language were further tyrannised during the Highland Clearances of the 18th and 19th centuries, where masses of Highlanders were forced to emigrate to make way for agricultural reforms of the then British government.Waves of mass emigration to North America and Australasia meant that these immigrants had to learn the lingua francas of the countries they immigrated to, i.e. English, and subtractive bilingualism occurred. Even in the 20th century, despite the council fiercely resisting continuous attempts to allow for bilingual road signs, it was not until 1973, when this was finally allowed. However, today, many with Scottish ancestry fail to realise that they belong to a culture that has its own language and take for granted the new rights they now have to celebrate this language. It’s a bit like the generations of women who have campaigned for the right to vote, only to have lots of women, decades later, not even bothering to head to the polls on election day. We humans do have a propensity of taking things for granted, things that generations have fought to have. Most Scots would be pleased to have organisations like Historic Scotland to look after, to preserve, and to show off their amazing irreplaceable heritage. Places like Skara Brae on the Orkney Islands are older than the Pyramids of Egypt and tell a story of the history of a people, a story of where we come from and what we were, and places like this need to be conserved and studied with care. Yet, many do not seem to see a parallel between these places and a complex language like Gaelic, which is filled with historical clues to the beginnings of the Scots. Perhaps an organisation like Historic Scotland could be accused of being formed for the profit-making, tourist-attracting schemes of the government, more so than the use of Gaelic on road signs. But no one would ever think that. It is, after all, not difficult to see the connection between historical monuments and the history and culture of a people. It is much more difficult to see that connection between a language and one’s culture, perhaps because language infiltrates every part of our everyday life and, therefore, is much more easily overlooked. So, no, if we don’t believe in taking a wrecking ball to Eilean Donan Castle, then let’s not let Gaelic die. Ngugi, W.T. (1986) Decolonizing the Mind: The Politics of Language in African Literature. Portsmouth, NH: Heinemann. Schaefer, R.P. and F.O. Egbokhare (1999) ‘English and the pace of endangerment in Nigeria.’ World Englishes 18/3:381-91. Swerdlow, J.L. (1999) ‘Global Village’, National Geographic 196/2:2-6.